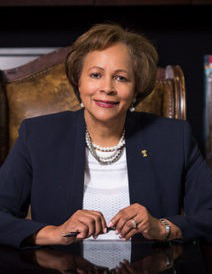 Bennett College, the private, all-women’s historically Black college (HBCU) in Greensboro, North Carolina, received two major financial gifts on Thursday, bringing its fundraising total to $2.7 million, Dr. Phyllis Worthy Dawkins, the college president, announced at a news conference. The $500,000 gifts from both The Papa John’s Foundation and the Z. Smith Reynolds Foundation are the largest contributions in the 146-year-old institution’s $5-million fundraising campaign to reinstate the college’s accreditation by Feb. 1. With the fundraising deadline a week away, Bennett leaders believe the latest gifts will inspire others to continue donating and investing in the college’s future. Last month, Bennett appealed a Dec. 11 decision by the Southern Association of Colleges and Schools Commission on Colleges (SACSCOC) to remove the all-women’s HBCU from membership due to its financial standing. Leaders issued a call for support in advance of a Feb. 18 formal accreditation hearing, sparking the #StandWithBennett campaign. Recent contributions to the college have come in from Black fraternities and sororities, such as Alpha Phi Alpha Fraternity Inc., which donated $31,000 last week, and Delta Sigma Theta Sorority Inc., which raised $30,000 for Bennett. In addition, Newmark Knight Frank, a commercial real estate advisory firm, recently donated a check for $10,000 on Thursday. During the news conference, Bennett board chair Dr. Gladys A. Robinson thanked Z. Smith Reynolds Foundation executive director Maurice “Mo” Green for the foundation and trustee’s generous gift of half a million dollars and acknowledged the foundation’s investment in education. Dawkins said she hopes the “world-wide” attention will not stop the donations because the college needs to continue planning and operating for the future. “We are hoping that the funds received will continue to supplement our vision to re-engineer the institution for the future focusing on market-driven programs, building the endowment, increasing enrollment and retention and just improving student life overall,” she said. The institution’s newly approved strategic plan “Innovate 2020” will focus on integrating technology into academic programs, workforce preparation and how Bennett operates in its organizational structure. Moreover, leaders have already identified new programs for students in cybersecurity, health sciences, technology and other areas based on market-driven studies and Bennett has also accepted 4,000 students for the fall, leaders said. “We are pleased that students are still interested and students of color are still coming to Bennett College,” Dawkins said. Founded in 1873, Bennett became women’s only in 1926, making it and Spelman College the only two HBCUs to exclusively educate women. HBCU queens and kings, students and alumnae, celebrities and national organizations are among the throng of supporters who #StandWithBennett as it appeals SACSCOC’s December accreditation decision. Presidents of several women’s colleges also noted their solidarity with Bennett, highlighting the sense of sisterhood found at the institutions and their mission to prepare strong women leaders. “Hollins stands with Bennett and supports the college’s enduring commitment to prepare women to lead lives of consequence,” Lawrence said. Dawkins said that come February, Bennett College will be in “excellent condition” to be successful with its appeal. Should the appeal be unsuccessful, leaders will enter into a lawsuit with SACS. Lois Elfman contributed to this report.